This past spring (2015), while in the process of working with the Columbia Center for New Media, Teaching and Learning on preparing a pilot database of Footprints: Jewish Books through Time and Place, undergraduates in JTS’s senior capstone seminar modeled the ways in which this database can provoke enriching learning experiences. Indeed, my students could feel Jewish history come alive, as they considered many Jews studying the same Hebrew book-copy in different times and places. Even thinking about its survival until the present day incited them to think about the cultural power of Jewish books. I introduced them to our database, hoping that they would be able to enter footprints even in its earliest iteration. While drawing my students to think about the Jewish book of the past, they also were able to learn about the power of technology to preserve that past. Our database Footprints is our contribution to innovating research done on the Jewish book so that we can know more about the personal histories of books. And while we encourage our colleagues and students to continuously add footprints to this database so as to widen the knowledge we can glean about the history of the Jewish book, we also encourage professors to teach with the database so as to inspire a new generation of Jewish book culture, actively contributing to its future. De bello Judaico by Flavius Josephus. Since the dawn of history, the written word has served to define us as a species and to provide us with a vessel to pass down insights through generations. Each individual written work—from scroll, to manuscript, to codex—represents a moment in time and space when an idea was conceived and documented. These works were sometimes shared with a chosen few, or distributed widely across regions or continents, instilling every copy of a given publication with its own history, and journey, to share. This is the essence of the Footprints project—an exploration of Jewish books through time and place. Footprints is a collaboration among Dr. Marjorie Lehman, associate professor at the Jewish Theological Seminary (JTS); Michelle Chesner, Jewish Studies Librarian at Columbia University; Dr. Adam Shear, associate professor at the University of Pittsburgh; Dr. Joshua Teplitsky, assistant professor at Stony Brook University; and the Columbia Center for New Media Teaching and Learning (CCNMTL). The product of this collaboration is a new website designed to trace the movements of early modern Jewish books by way of analyzing evidence of provenance from around the world. CCNMTL designed and developed a pilot database, administrative interface, and front-end browsing interface for the Footprints website, in partnership with the research team. The process for creating a complex, dynamic website such as Footprints was challenging on multiple levels—technical, academic, and philosophical. Many of these challenges were faced simultaneously in order to design a usable, aesthetically pleasing interface that meets academic standards and has robust metadata within a fixed timetable. Limited time and resources forced us to prioritize addressing these challenges, leaving some for a later iteration. Other challenges were more practical in nature, such as the sheer magnitude of entering data into the system; or pedagogical, an evolving element of how best to incorporate this project into the classroom. Our most complicated challenges were grounded in library science—capturing the most complete and accurate metadata possible given highly fragmentary sources. One such hurdle was in dealing with ambiguity and uncertainty, particularly in defining dates and places, a problem that has been faced by other projects with similar characteristics. Our research turned up several methodologies to account for uncertainty, but we needed a method that could later be visualized on a timeline, which resulted in adoption of the Library of Congress Extended Date Time Format. Throughout this process we’ve received immeasurable feedback from students, researchers, and librarians that has allowed us to quickly adapt and iterate to find solutions for these challenges. Early in the development, the team conducted a “research-a-thon” designed to bring in scholars, librarians, and other interested parties to talk about the project and enter in sample data. The feedback gleaned from that session, and subsequent attempts at entering data by the researchers, provided great insight into the complexity of our data model and user interface. During the spring semester, we piloted the site with two classes, one at JTS and one at the University of Pittsburgh. The student feedback we received gave us an essential look at how the site can be used in a classroom, suggesting design modifications needed to facilitate effective learning exercises for undergraduates. 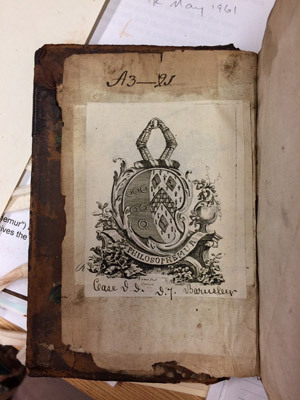 The ongoing renaissance for tracing the history of books, particularly as more books are digitized, emphasizes the study of books-as-objects as an integral part of the humanities. Jewish books in particular have a fascinating history that tells an important story about the spread of knowledge and faith in the diaspora, in societies that often persecuted it’s practitioners. Keeping in mind our goal of telling the stories of Jewish books, we continue to explore how the Footprints project can further our understanding of the cultural and religious significance these books represent.